Posted on 01/31/2019 by Parklifer	in Preview and tagged Georgia, hard rock, nu-metal, Rams Head Live, Sevendust. Rockers Sevendust released All I See Is War, the band’s 12th studio album, last year via Rise Records. The gents are touring in support of it, and they stop at Rams Head Live in Baltimore on Sunday, Feb. 10. Lajon Witherspoon (vocals), Clint Lowery (guitar), John Connolly (guitar), Vince Hornsby (bass), and Morgan Rose (drums) made their new album to combat conflicts on the street and on social media. In a review of All I See Is War for Cryptic Rock, Patricia Jones applauded Sevendusts’ flexibility. “The band made their bones on being malleable and almost unpinnable. While many bands easily fit into a single niche, Sevendust has long defied singular definition. Are they Metal? Are they Hard Rock? Are they actually considered Nu-Metal or Alternative? Whatever you call them, don’t call them lazy. Like a fine wine, Sevendust seems to just be getting better with age, and All I See Is War is their latest gift to the world. 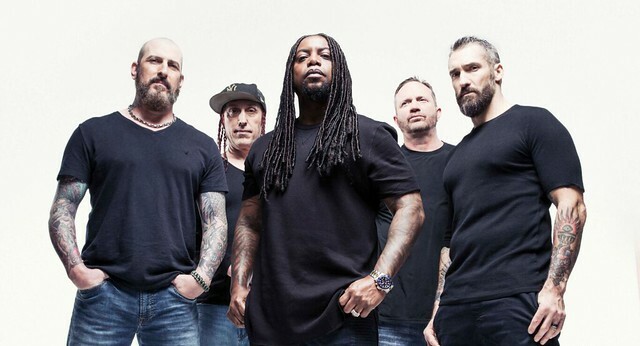 So, for unyielding commitment to their craft, passionate songwriting, and emotional impact, CrypticRock give Sevendust’s All I See Is War 5 out of 5 stars,” Patricia wrote.